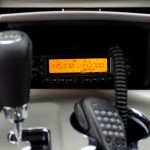 If you are interested in ham radio and you buy a new car, the question of whether you want to install a radio in the car comes up, and if you do want to install it, how and where does it fit. For some people, these are easy questions to answer: Yes, and wherever is most convenient. But if you are like me, you may have an aversion to making holes in a brand new car, and also worry at least a little about the look of the final installation. 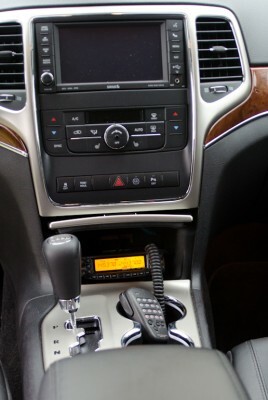 I have a Yaesu FT8800 radio which I had installed in my previous car (a 2005 Jeep Grand Cherokee). 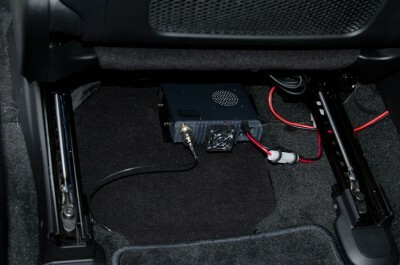 In that case, the radio was mounted under the dash, power came from a cable running through the engine compartment firewall, directly to the battery. The antenna was mounted on a K400 mount secured to the edge of the hood, a few inches from the rear, and the antenna cable run around the driver’s door weather seal directly into the engine compartment. When I started looking at the new Jeep (2012 Grand Cherokee), there were a few problems with simply using the same scheme. The first problem was that the dash construction has changed significantly. On the 2005 version, the dash under the steering wheel was fairly thick plastic, hinged at the bottom with clips at the top. A firm tug would open it up, and it would fold down exposing all of the wiring, and access to the firewall. On the 2012, the plastic is much thinner, and is held in place with screws and (many) clips. It is a non-trivial task to open that up. Next, I looked in the engine compartment to see if there were any conveniently unused holes through the firewall, or if it were possible to piggy-back on existing cable holes. There immediate answer was no. No spare holes, and suspiciously few things actually passing through the firewall, which now seemed to consist of two well spaced metal barriers. But the biggest surprise was … no battery. A bit of Googling informed me that on these cars the battery is now inside the passenger compartment, under the passenger seat. Ok, so how do I get to it? Well, the official Chrysler method seems to begin with “remove the passenger seat”. Hmm… really?? Yes. Really. I took a look, the passenger seat is also home to the audio system amplifier, and being an electrically operated seat, and heated, there are quite a few connectors that would need to be undone before you could even start to remove the seat. However, it appears that the instructions had been written with non-electric seats in mind. The electric seats have much more travel, and most importantly, can be raised up, giving more room to get access. Moving the seat right forwards and up gave enough access to allow the one edge of the battery compartment cover to be lifted. Moving the seat right back gave access to the other end of the cover, and wriggling fingers under it and lifting popped off that end of the cover, revealing the battery. Now, how to connect to it. Unlike previous cars, there are no convenient nuts and bolts securing the cables. In this case, there is what appears to be a plastic wedge arrangement which is tightened with a nut and bolt. Of course, the plastic does a fine job of insulating the securing nut and bolt from the terminal. Closer inspection revealed a secondary connection on the positive terminal, so loosening that off allowed a spade terminal to slide under, and tighten back up for a good connection to the positive side of the battery. For the negative connection, there was no hope of connecting directly to the terminal, so a connection was made to the car body via the nuts securing the battery clamp. That worked fine. The FT8800 has a detachable face, and when I bought it, it came with a remote mount kit to mount the face separately from the radio. I looked around for somewhere to mount the face, and eventually settled on the idea of using the compartment with a door, in the middle of the dash console below the radio and heater controls. For the radio body, I explored several options, but decided that under the driver’s seat was probably going to be the best location. There is a similar panel to the battery cover under the driver’s seat. Lifting this revealed a number of connectors to pass wiring looms to the outside of the car. This provides a relatively secure location to mount the radio mounting bracket without having to make holes in the bodywork. The power cable was fairly easily passed across the center console by removing the plastic panels on each side, and running the cable in front of the gear selector. The cable tucks up under the plastic panels on each side and so is not visible. The small compartment chosen for the radio head has no easy location to fix the plastic holder for the head. It does have a rubber tray in the base, which fits fairly tightly into a shapped depression at the bottom. I used a piece of metal bent to fit, with each end sticking up, one end to attach the radio bracket, and the other to attach to the rear of the compartment. Exterior quality double sided tape was used to secure the bracket to the rubber mat, to the radio head bracket and to the rear of the compartment. A small hole, just big enough to pass the connector on the cable connecting the head to the radio body was drilled in the rear of the compartment (invisible, unless you know it is there, and go looking for it with a light). The same panels removed to run the power cable gave access to this connecting wire and allowed it to run alongside the power cable. There is room to place the microphone inside and close the door when not in use. 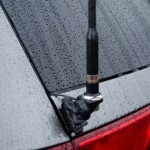 The next obstacle to face was mounting the antenna. Purists would go straight to drilling a hole in the center of the roof and installing an NMO connector. I am not enthusiastic about making holes in the roof of my new car, and besides, it has a moon-roof and sun-roof and so the majority of the roof is glass. I initially looked to my K400 mount. But this requires a flat edge around 4″ long. When I looked, this car is amazingly … curved. Hardly a straight edge anywhere. The only flat edge on the hood would be pretty close to the front. Not only would that look odd, but getting the cable into the engine compartment would be a challenge. I eventually settled on the idea of using a glass-mount antenna, but various obstacles prevented me from going in that direction. I eventually decided that a section of flat metal about 2″ long on the rear door might work. Especially since there is a convenient hole with rubber plug at the top left of the body underneath the door. I obtained a K412S mount, which is similar to the K400 but only requires about 1.5″ of space to mount. This fit perfectly. The hard part was getting the cable from the hole under the door, to the space behind the plastic trim at the roof level. I could get a piece of plastic “string” through, but there was just not space to pull the SMA connector through. After about an hour of trying, I gave in and removed more plastic trim around the top and left of the rear door. This enabled me to thread the cable through fairly easily. When it got to the rear door, I simply pulled the door seal away, and tucked the cable behind the exposed interior trim, down the side of the car, under the door sill and out to the radio. I initially had some doubts about whether the radio would be really audible in that position, or if I would need to look at obtaining and mounting an external speaker. As it turns out, the radio is perfectly audible. The antenna position is not ideal, but in practice seems to work very well. I don’t think that I would want to mount my larger (5/8 wavelength) antenna on that small mount, but the 1/4 wave seems to work just as well for most purposes. The only slight disadvantage to having the antenna in this position is that the glass door panel can’t be opened without unscrewing the antenna. In practice I virtually never used the glass door panel on the previous car, so don’t expect this to be a significant problem. 1. Battery under the passenger seat? Are you kidding me?? From your description it sounds like it would be a minor nightmare to replace the thing if/when needed. 2. 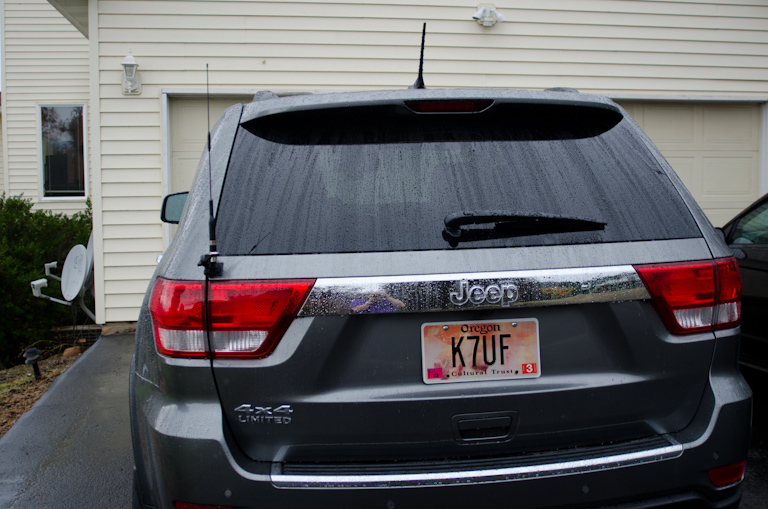 Your antenna mount seems to have little ground plane. What’s the propagation like? 3. Is there enough air exchange under the seat to allow for the the radio body to cool? 4. How hard is it to string the wires etc within the interior paneling of the car? The battery would be a pain to replace. I think that with electric seats, it just might be possible to replace it without removing the seat. In some ways its perhaps not a bad idea to get it out of the engine compartment. It is subject to much less heat, and its not located right over the front suspension, so probably isn’t subject to as much vibration. However, I can’t help thinking that under the back seat, with a seat that just lifts up (as I seem to remember the VW Bug used to have) would be better. Its a high capacity AGM battery. Not the sort of thing you find in your local supermarket. Looks like a new one costs $450 from Chrysler. So with labor, I wouldn’t be surprised to see a bill approaching $1,000 for battery replacement. Yes, the ground-pane is far from perfect. Does it make much difference? Not that I have ever noticed. At extreme range, you probably would notice a difference. For local(ish) repeater use, its fine. There is plenty of room for good airflow. Threading the interior cables really only requires a willingness to fiddle around (a lot) and to be prepared to pop off some of the plastic moldings. You can get fairly decent tool-sets (made of plastic, so as not to scratch) for ~ $10. I have a set, but didn’t have to use them. Fingers work fine 99% of the time. You just have to not bend to the point where the plastic breaks, and be aware of any screws. Sometimes, there are screws as well as clips. My favorite for running antenna cables is to pull the rubber door seal down from the top of the door frame. This usually exposes the edge of the roof liner, and the space above it. Really useful for running cable from front to back. Similarly on the sides of the door frame to run cable from top to bottom. Just don’t go mad poking things too hard. Remember that many cars have side air bags, which are located in the trim near the roof. You don’t want to set one of those off. Just running a cable above or below it is not going to be a problem. The hardest part is always when you have to leave the passenger compartment. Typically to get to the battery for power, or elsewhere for the antenna. Older cars used to have various holes pre-drilled through thefirewall for various options, and the hole sealed with a rubber grommet. If you have one of these, you just use that existing hole/grommet. These days, there seem to be no spares. Often it is possible, with a bit of wiggling, to get an extra couple of wires through where some existing cable loom passed through, although if my new car is any example, even this might not be possible. In this case, the only option is to carefully survey the firewall, from both sides, and select an area where you can drill a new hole. Get a selection of grommets (RadioShack?) and choose one which is a nice fit for your cable, then drill an appropriate sized hole. Fortunately, I have never actually had to do this. Remember that the power cable needs fusing, and the fuse should be close to the battery.